Since beginning my work with digitizing the General Assembly Session Records collection at the State Archives, I have had to do a bit of research on how to effectively interpret 18th century manuscripts in order create the appropriate metadata for the records and improve discoverability of these records in our digital collection. The following sections include a brief history of writing during this time period, characteristics of 17th and 18th century British-American handwriting, and some tips on deciphering the text found within these records. This is the third blog post of a series on how to read handwritten colonial documents, see the first blog post of this series on abbreviations, shorthand, and lettering, and the second post of this series on writing styles. Phonetic spelling is reflective of regional accents, personal speech patterns, and inconsistent pronunciations of the same word by different people (Leary, 1996). I have noticed this to be especially true while working with the General Assembly records, as it’s evident that spelling proficiencies depended on preference or education level of the clerk and/or public official. Fortunately, Noah Webster published The American Spelling Book in 1783 and America’s first dictionary in 1806, which has since helped significantly in bridging the spelling gap. It’s important to take time to study the handwritten text. Use context clues to determine the content of the message and better understand the intent of the writer. Use reference tools and resources: it may be necessary to consult geographical dictionaries to identify unfamiliar town names and/or understand town origins. In examining North Carolina records, a great online resource for this is NCPedia, which includes access to an excellent geographical dictionary, the Gazetteer. Getting a second opinion doesn’t hurt, especially from your friendly neighborhood reference archivist! Jokinen, Anniina. (1996). Sir Walter Ralegh (1552-1618). Luminarium: Anthology of English literature. Retrieved from www.luminarium.org/renlit/ralegh.htm. Kirkham, E. Kay. (1964). How to read the handwriting and records of early America (2nd ed.). Salt Lake City, UT: Deseret Book Company. Kirkham, E. Kay. (1973). The handwriting of American records for a period of 300 years. Logan, UT: Everton Publishers. Leary, H. F. (1996). North Carolina research: genealogy and local history (2nd ed.). Raleigh, NC: North Carolina Genealogical Society. Monaghan, E. Jennifer. (1988). Literacy instruction and gender in colonial New England. American Quarterly, 40(1), 18-41. Osborn, Albert S. (1929). Questioned documents: a study of questioned documents with an outline of methods by which the facts may be discovered and shown (2nd ed.). Albany, NY: Boyd Printing Co.
Tannenbaum, Samuel A. (1930). The handwriting of the renaissance. New York: Columbia University Press. The UK National Archives. Palaeography: Reading old handwriting, 1500-1800, a practical online tutorial. Retrieved from http://www.nationalarchives.gov.uk/palaeography/further_practice.htm. Thornton, Tamara. (1998). Handwriting in America: A cultural history. New Haven, CT: Yale University Press. West, Andrew. (2011). The rules for long s. TUGboat, 32(1), 47-55. Retrieved from www.tug.org/TUGboat/tb32-1/tb100west.pdf. Yeandle, Laetitia. (1980). The evolution of handwriting in the English-speaking colonies of America. The American Archivist, 43(3), 294-311. This entry was posted in Digital Collections and tagged colonial records, Genealogy, handwriting, history, North Carolina Digital Collections on September 1, 2017 by Sara. Very nice summary. Thank you for posting your experiences as it will help me with old documents. 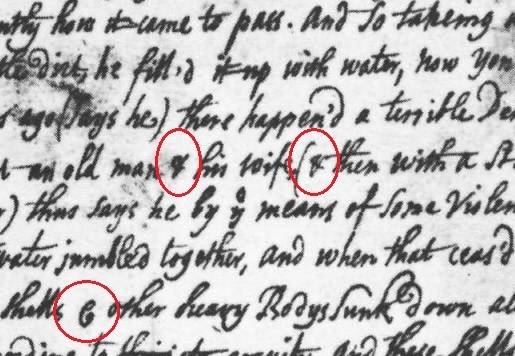 Unless I read too quickly, I did not notice a symbol for the ampersand in early American documents. I am transcribing a will from 1817 and I believe the writer (not the deceased but the court clerk, I believe) seems to use a symbol that looks much like a modern capital P with a curl going up. Have you seen this, and am I correct? Hi Susan! I’ve noticed a lot of variation in the style of ampersands, actually! I found a couple of examples, though I’m not sure if I’ve seen what you’re describing. Let me know if you see it in the following examples. That last guide also suggests that ampersands were often stylized to the preference of the writer, which makes it difficult for interpreting later on! I hope these examples were helpful!